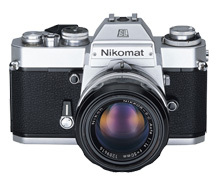 The introduction of the Nikomat series on the market in 1965 triggered an additional surge in the demand for high-end SLR (single-lens reflex) cameras, after which SLR cameras reached the zenith. We, at what then was Nippon Kogaku K.K., phased out of producing the unprofitable popular models and placed emphasis on production and sales of high-end models. Nikon F, the leading model of high quality SLR cameras, played the driving role in changing the policy and contributed to an increase in sales. In April 1967, Nikon F Photomic TN went on sale as a successor to Nikon F Photomic T (released in September 1965); following the redesign of the Photomic T finder assembly and changing the exposure measurement system from averaged brightness measurement to center-weighted metering, which concentrates the meter's sensitivity on the center of the picture frame (φ12 mm). This model evolved into Nikon Photomic FTN in September 1968, featuring an expanded metering range (giving the exposure time of 4 seconds at T shutter speed) and an easier way to set the maximum aperture when changing lenses. For interchangeable lenses, the mirror-up device-free fisheye lens Fisheye-NIKKOR 8 mm f/2.8 and the ultra wide-angle lenses NIKKOR Auto 20 mm f/3.5 and NIKKOR Auto 24 mm f/2.8 were on the market from 1967 through 1970. In addition, Zoom-NIKKOR Auto 50 - 300 mm f/4.5, Zoom-NIKKOR Auto 80 - 200 mm f/4.5 and other zoom lenses also went on sale, which helped the growth of a variety of interchangeable lenses and expanded the range of accessories. 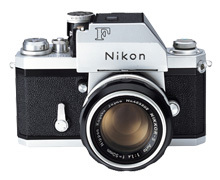 In this manner, Nikon F became much more sophisticated, making full use of the compatibility of available facilities with its body as a base, and incorporating technological advances and ideas, which fueled the subsequent demand. The Nikon F was valued highly especially outside Japan, and an increasing number of professional photographers used Nikon F regularly. 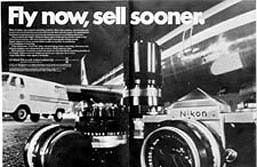 In addition, most expedition parties and observation teams who operated under harsh conditions carried the Nikon F.
Moreover, some airlines and banks in U.S. selected Nikon for their advertisements to exhibit their positive corporate images through the high performance and reliability of Nikon brand products. In response to the surge in demand, the Camera Division expanded the production plant and made organizational changes to increase the production capacity. The streamlining of production, and the increase of production through expansion of production facilities in subsidiaries followed. In actuality, however, all this while the sales volume continued to increase sharply, and production had a hard time catching up with the demand for a long period of time. This situation was remarked upon by writer Saburo Shiroyama in the 1970 March issue of the "Camera Mainichi" magazine, in an article entitled "Why can't we get a Nikon F?" in which the unavailability was attributed to the corporate culture of Nippon Kogaku K.K. involving the sincere attitude of the engineers, which has helped Nikon in gaining a solid reputation though it is acting as a brake on production increased. His comments ended with the statement that the unavailability would persist unless Nippon Kogaku K.K. abandoned their sincere philosophy of emphasizing the technology. Nikon F was produced in Yokohama Works starting in 1971, and production was to discontinued in March 1972 after the introduction of the next-generation mainline camera (Nikon F2). However, in response to the persistent demand in the domestic and export markets, it was decided to continue production and an output-increasing system was set up involving the subsidiaries which were asked to share in the production. Nikon F was developed originally as a system camera and then was brought nearer to a perfect system through the successive introduction of accessories designed to be detachable from the body to allow a wide range of shooting distances. The needs of the users became sophisticated and the request for improved functionality and performance increased. Then, we devised a plan to develop a new model A Camera which would follow the basic features of Nikon F and share the interchangeable lenses and other accessories with Nikon F, in consideration of the fact that the body mechanisms would have to be redesigned for a thorough improvement of functionality and performance with an eye to the near future, and started the prototype manufacturing in September 1965. In July 1970, a pre-production prototype was completed as the embodiment of "system camera" which successfully achieved the four objectives. This A Camera inherited the technical philosophy for designing the highest quality SLR cameras, which had been accumulated and refined in the evolution of Nikon F, and added the novel features as listed below. The shutter blind running speed was increased by two times to 10ms (milliseconds) and the high-speed shutter speed of 1/2,000 sec. was newly incorporated in the shutter system. A high-precision variable speed control cam was adopted to allow intermediate shutter speeds from 1/80 to 1/2,000 sec. The flash synchronization was at 1/80 sec. (at 1/60 sec. in Nikon F). An ultra slow shutter speed between 2 and 10 sec. was attained with the use of a self-timer. These enhancements of the shutter contributed to the further expansion of the shooting range. For the finder system, a large mirror was adopted with the mirror vertical length increased to 30 mm from 28 mm to prevent possible eclipse on the mirror in the finder system of long-focus lenses. In addition, Photomic Finder was improved to allow the indication of the shutter speed and an aperture value in the field of view, as well as reading on any coupled exposure meter despite its reduced size. 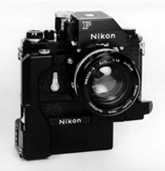 Furthermore, the hinged opening/closing design was adopted for the back cover (the back and bottom covers in Nikon F were removable), and the shutter release position was moved to the front on the top cover (from the rear on the top cover in Nikon F). 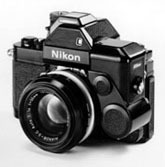 In terms of the profile design, the battery holder and switching mechanism for the exposure meter, which had been integrated in the Photomic finder in the Nikon F Series, were moved to the body to help downsize the camera head. In addition, the body was redesigned with both ends rounded to fit snugly in the palm of the hand with consideration given to tactile feeling. The completion of the prototype was not followed by immediate entry into mass production. It took about one year from completion of the prototype to the appearance on the market for these reasons: The pace of startup of mass production of any new product was decelerated since the production line had been busy with boosting the production of Nikon F for a prolonged period of time, and particularly greater importance was attached to quality assurance including the achieving the stability of the high-speed shutter for use by professionals and the performance of the 500,000 lux-minute light leak test (to expose the articles under test to 10,000 lux for 50 minutes). Center-weighted exposure measurement at open aperture, Manual exposure control. Shutter speeds: 10ms, T, B, 1 to 1/2,000 sec. with intermediate shutter speeds available from X (1/80 sec.) to 1/2,000 sec. ultra-slow shutter speeds possible from 2 to 10sec. The A Camera which successfully fit the needs for increased performance and greater versatility was named Nikon F2 (with eye-level finder) and Nikon F2 Photomic (with Photomic finder incorporating a new TTL exposure meter), which were disclosed to the news media in August 1971. Then in September, a preview was held at Tokyo by inviting a total of about 3,000 guests including professional news photographers, distributors, and selected users. Additional previews were held in succession in six big cities, Osaka, Sapporo, Fukuoka, Sendai, Hiroshima and Nagoya. In addition, in the Tokyo Nikon Fair held in the same month (September 17 to 22) at the Keio Department Store in Shinjuku, Tokyo, to commemorate the appearance of Nikon F2 on the market, 260,000 camera fans rushed in exceeding the 230,000 visitors to the Japan Camera Show in that year, causing a large turnout at the Fair. In other countries, a preview was held in August in New York, U.S., and an announcement was made at the meeting of sales agencies in European countries held in September in Amsterdam, Netherlands, which was followed by the release in October. Nikon F2 Photomic was evolved into Nikon F2 Photomic S in March 1973 by replacing the Photomic finder with the Photomic S finder which adopted the LED (light emission diode) indication and expanded the metering range in the lower luminance to -2 EV. 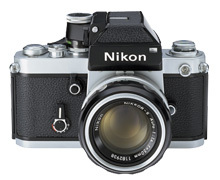 Nikon F2 Photomic S implemented the shutter-priority automatic exposure control with the EE Control Unit which went on sale in conjunction with it. This, combined with the automatic film wind and rewind function available with the specifically designed motor drive MD-1, and the later described automatic focusing achieved with AF Nikkor 80 mm f/4.5 (trial manufacture), contributed to meet the three requirements for automatic cameras: 1.) correct exposure, 2.) film wind and rewind function, and 3.) focusing, and provided the first step toward "full-automatic cameras". With the emergence of the Nikon F2 Series, the production of Nikon F Series, which had been a favorite for 15 years, was discontinued in September 1973 with a total sales volume of around 862,600, and sales were concluded in June 1974 with the clearance of the inventory. From 1960 onwards, technological innovation made remarkable progress with the use of computers and ICs. Cameras were also becoming increasingly electronic with the introduction of cutting edge science and technology. 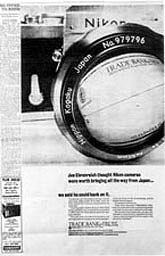 In fact, a camera with electronically controlled shutter made is market debut in 1965, and in 1968 TTL automatic exposure control 35 mm single-lens reflex (SLR) camera appeared. We released the Nikomat EL in December 1972 as the first electronically controlled shutter SLR camera aimed at the electronic camera market. A key feature of EL was, needless to say, the adoption of an electronically controlled shutter, which allowed step-less automatic control and selection of the proper shutter speed in the range from low 4 sec. to high 1/1,000 sec. for a (aperture-priority) correct exposure once an aperture was set. The core of the shutter speed control circuit was configured with a single monolithic IC. This camera was the first to practically apply to cameras the monolithic IC, which was made up with 74 transistors, 27 resistors and aluminum-deposited lead wires printed directly on a 2 mm-square silicon chip. For the power supply for the electronic circuit, a silver oxide battery (one 6V 4G13, the present 4SR44,) was used for its superior low-temperature resistance and long useful life. This camera was also configured with the FRE (a metal foil resistor that delivers the information such as film sensitivity and lens aperture value to the control circuit) and a storage circuit that made good use of the automatic exposure control. This provided any intended correct exposure even during shooting in backlit condition. The product was a full-scale electronic camera making full use of our electronic technologies. On top of the penta prism, there was a JIS-compatible hot shoe. In addition, giving consideration to the limited availability of silver batteries for cameras in those days, provision was made to allow use of a mechanical shutter at 1/90 sec. whenever and wherever the battery went dead. The interchangeable lenses and accessories were mostly shared with Nikon F Series. In 1965, the Laboratory launched the development of an automatic focusing (AF) system for single-lens reflex (SLR) cameras and succeeded in April 1971 to implement the automatic focusing lens AF Nikkor 80 mm f/4.5. It was designed to identify the position at which the image of the subject at the center of finder became sharpest, using a photoconductive element. 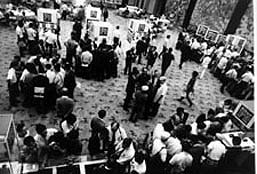 The lens was put on display in the Photo Expo held in the same month at Chicago and attracted considerable attention. It was exhibited also in the 12th Photokina in September 1972 together with the Nikon system configured primarily with Nikon F2 Photomic S and the Nikomat EL, and the world's first developed autofocus interchangeable lens was hit by a barrage of questions from earnest visitors. In April 1961, Major Gagarin in the former Soviet Union succeeded in making one orbit of the earth in the first manned spaceflight in the spacecraft Vostok 1. Then, in May the U.S. launched a manned satellite ship and the astronaut Colonel Shepard used a 16 mm cine camera (of special design manufactured in U.S.) first in space to take photos from the ship. Since then, cameras have been playing an increasingly important role in spaceflight. NASA (National Aeronautics and Space Administration) selected Nikon products as payload cameras for the spaceships Apollo 15 to 17 in the Apollo Program which had been launched in 1961 aiming at manned lunar landing, and in January 1971 we entered into a contract with NASA to supply our cameras. 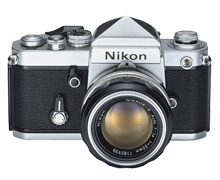 Nikon Photomic FTN was selected as the base model for the cameras for the Apollo Program. However, the lubricating oil and other materials and equipment used were all based on the special NASA specifications, and product specifications also included special requirements. The requirements were exacting as follows: the cameras should pass the tests to demonstrate that camera operation never affect the electrical systems in the spaceship; the outside of cameras should be black matte finish to eliminate any problem due to reflection of sunlight; adequate reliability should be assured against extremely high and low temperature, humidity, and vibration and impact (approx. 7 G) during the launching; and delivery times are shorter. We delivered 9 cameras (with 55 mm f/1.2) and relevant accessories in June 1971 that had successfully satisfied all of the NASA requirements, and the spaceship Apollo 15 with the Nikon products was launched in July. Nikon Photomic FTN was also selected as a special camera system for use in the space station "Skylab" which operated in 1972 for the objectives of proving that humans could live and work in space for extended periods and achieving rendezvous and docking with artificial satellite in addition to the above described application for the Apollo Program. In the Skylab, the Photomic FTN cameras were primarily used to take pictures of the ozone layer over the earth and the aurora at dusk at regular intervals using the interval meter. 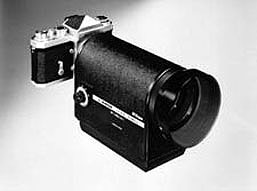 One camera model was designed to the same specifications as for the Apollo Program, and the other one was a motor-driven camera equipped with the specifically designed long-loading magazine with the UV Nikkor 55 mm f/2 lens for ultraviolet rays to allow shooting in the UV range of 200 - 400nm (nanometer). These products were all supplied successfully by March 1972. Also installed aboard the Skylab was Nikon Portable Microscope Model H (put on sale in December 1958) that was modified to take micrographs when coupled with a camera. By the way, in the Antarctic expeditions involving exacting requirements, a variety of Nikon products have been adopted as formal observation equipment since the first Japanese Antarctic expedition in 1956. The project of Antarctic expedition was interrupted once in 1962, but it was resumed in 1965, and in November a total of 27 various cameras including various spectroscopes for aurora observation, microscopes, Nikon S3, NIKONOS, Nikon F, Nikon F Photomic T, Nikomat FT and Nikomat FS and a lot of various NIKKOR interchangeable lenses to be coupled with theses cameras were dispatched as formal equipment for observation and research with the 7th Antarctic Expedition Party. These pieces of equipment had all passed the low temperature tests as eligible equipment for polar expeditions to demonstrate that they could perform fully even in the extreme cold at 60° below zero, and they delivered their performance in the observation and research of auroras, terrestrial magnetism, ionosphere, weather, living things, geological feature, and earthquake. Product and company names in this article are trademarks, registered trademarks, or products of their respective owners. Colors of product photographs on the monitor may differ from the colors of the actual products.